Pits, basins or small closed basins that fill with water in the epochs of rain. 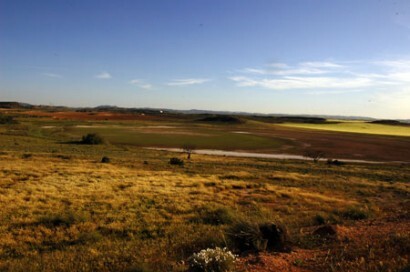 Alcañiz's salty lagoons are a set of approximately 30 basins where there are alternated the cultures of dryness and summits by vegetation of bushes. In this type of basins the water flows, underground, from the zones of it recharges perimetrales towards the center of the basin. The water gets lost only for evaporation, for what you them go out they center in the lagoons, which receive the popular name of salty, for the one that has ended them knowing. The salty one of major size is the salty big one with more than 1 km from surface. It places near to The estanca. it suspends and contains good water divides of the year. But the strong evaporation caused by the cold north wind or the summer heat provoke the ascension of dissolved salts that settle in the shores.